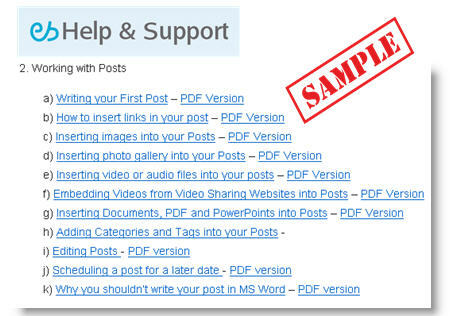 Looking for help for your blog users? If you’re looking for ideas for support material for your WordPress MU users I recommend you take the time to check out the new Getting Started With Your Blog I’ve been writing for our Edublogs Help and Support site ! Sure a few sections, such as Signing up for your blog and Logging into your blog dashboard, are specific for Edublogs and Edublogs Campus users but the rest apply to any blog powered by WordPress. It’s broken into ‘tasty bite-sized’ sections packed with tips I’ve gained from working closely supporting blogs users. Each part can be viewed online or downloaded as handy PDFs. Perhaps the best news is that we’re planning on uploading Word document of each section to WPMU DEV Premium where people will be able to download, edit and rebrand it at will! And yes, before you ask, it’s not quite finished yet! While you’ve been sleeping (and perhaps also awake) I’ve been slaving over the hot stove to get it done– subscribe to this RSS feed to have new sections home delivered! Hope you enjoy….. please send chocolate to keep me sustained while I finish the rest.